AskAlan mailbag: How will Tiger Woods fare in 2019's majors? #AskAlan mailbag: How will Tiger fare in 2019’s majors, and would Woods-Poulter be the ultimate Sunday singles match? Tigerpalooza leading straight into an epochal Ryder Cup? We don’t deserve this… Who is your pick to finish second in each of the 2019 majors considering Tiger is going to win the Grand Slam? [email protected] Easy, turbo. A lot can happen in six and a half months, which, unfortunately, is how long we have to wait until the Masters. But Tiger’s performance at East Lake does alter the landscape of next year’s majors, especially since Pebble Beach is hosting the U.S. Open and Bethpage the PGA Championship and Woods has done rather well on those venues in the past. For much of this season Tiger’s biggest weakness was his driver, which was so errant he was swinging it less often than his younger, more fearless competitors, putting him at a serious disadvantage. As long as Tiger’s driver was a liability it was hard to see him winning on brawny tracks like Augusta National and Bethpage. But after his virtuoso performance at East Lake – fueled by tweaks to his shaft and loft – those concerns have largely been mitigated. Who knows if Tiger’s back will hold up or if this soon-to-be 43-year-old divorced dad will continue to be willing to pay the price to stay razor-sharp for tournament play. But there is no question that the 2019 major championships just got a lot more intriguing. Was the opportunity to T4 his way to the FedEx Cup just too on-brand for Rosey to pass up? [email protected] Talk about failing upwards! Rose makes a hash of the finish at Aronimink…and goes to No. 1 in the World Ranking. Then at East Lake he gets the back of the hairbrush from Tiger…and wins the FedEx Cup. But big-picture, both developments are significant. Rose already had a very compelling case for the Hall of Fame: a U.S. Open win on a classic track, the gold medal, two Order of Merit titles, WGCs, etc. By ticking two more important boxes he’s now a lock. On a scale of 1-10 how disappointing was Rory's performance? -Peter (@pkeen52) If 1 is a Dustin Johnson shrug and 10 is Rory forlornly burying his head in his arm in Amen Corner circa 2011, I’m going with a million. Beyond the wild driving, loose irons and shaky putting, what was so disturbing was the utter lack of fight McIlroy displayed. Playing with his boyhood idol, with the entire world watching, he had packed it in before reaching the turn. Rory has always reveled in being old-school but it’s time for a full-blown intervention with a sports psychologist, to say nothing of a yogi and shaman. Tiger Woods tees off during a practice round on Tuesday in Paris. Who’s replacing Tiger as President’s Cup captain next year, since he will surely play in it? -Jacob (@mr_irrelevant) Hopefully nobody! The Presidents Cup is such a turkey the only thing that could make it even mildly interesting would be watching Tiger spin plates as a playing captain. It would be fascinating to see whom he pairs himself with and how he manages all the egos, including his own. I’ll be bummed if he gives up the post. The only thing that could top what happened at East Lake would be Tiger/ Poults in the last pairing of the Ryder Cup as the deciding match. Am I right???? [email protected] You are right. It would be redundant for Tiger to dust Rory or Rose, theoretically Europe’s two best players, since he just did that. Poults is a different kettle of fish. Tiger is better than him at every single facet of the game but you know that Poulter would fight to the death. Could he summon enough of his old Ryder Cup magic to actually steal a win? If we get the chance to find out it will be riveting theater. #AskAlan Do the FedEx Cup bonus pools count towards total career earnings? Thanks. -Daniele (@CricketFB23) No, that would skew things too much on the career money list, and being 25 and/or top 50 all-time remains a coveted exemption that older players can cash in to prolong their career on Tour. #AskAlan As the golf world is (and deservedly so!) humming Tiger's praises and debating with fervour if that's the greatest comeback in humankind's history, would you be surprised if 'our' man would be voted POY? [email protected]_2cents No doubt Woods is the man of the hour, and the best *story* of the year, but POY comes down to results, and Brooks Koepka still has it in the bag. Non-Tiger question: Koepka - what’s everyone’s view in the press room given that he said he would show you all [for not inviting him to a pre-tournament press conference] by winning and he ended up finishing 26th? #AskAlan [email protected] The consensus is that Brooks is a, uh, fascinating dude. He loves to say he doesn’t care about how much media attention he does or does not get while at the same time collecting and nurturing every single little snub. This seems mutually exclusive, but somehow Koepka is making it work for himself. In the history of the Ryder Cup, has there ever been a more potential game-changing captain’s pick than Tiger? #AskAlan -Ben (@Konocomm) Yes, Curtis Strange at Oak Hill. Oh, you meant game-changing in a *positive* way? It remains to be seen how much Tiger has left in the tank – he has to be emotionally exhausted after the win and physically run-down after months of non-stop golf at the end of a taxing season. I’d be very surprised if he plays more than three matches. But as far as bringing mojo/juice/buzz, there’s never been and never will be another captain’s pick like this one. #AskAlan What’s better prep for the Ryder Cup, playing poorly enough to miss the Tour Championship or finishing DFL in said event? [email protected] I’m delighted that Jordan was relaxing at home and working on his game last week – a rested, pissed-off and dialed-in Spieth should be a difference-maker for the U.S. I wouldn’t put tooooo much stock in Phil, Bubba, Brooks and Reed finishing last in Atlanta. 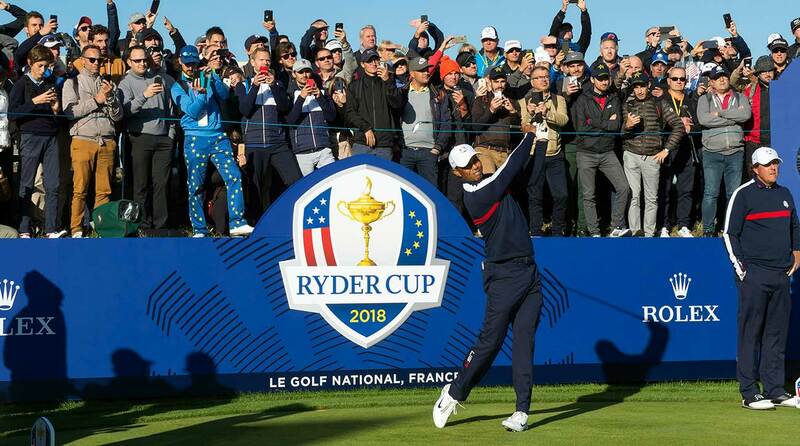 They burned up very little emotion or energy coasting through those four rounds and hopefully got to work on some specific things that will help them in Paris, unlike Rose, McIlroy and Rahm, who fought to the bitter end only to have their confidence dented by lousy finishes. #AskAlan #Rydercup Who are your dream singles matches? [email protected] Reed-Rahm (dueling volcanos), Jordan-Rory (fire and ice), Koepka-Fleetwood (U.S. Open rematch, two years running), Phil-Sergio (lions in winter), DJ-Rose (ballstriking Jessies), Bubba-Hatton (emotionally unstable mega-talents). What is your favorite Ryder cup venue and why? Where would you like to see the Ryder Cup played in future years? #AskAlan -Mark (@cottonmc) Honestly, the venue isn’t that big a deal. In stroke play the playing field is paramount, because each competitor is playing the course. In match play you’re just trying to beat the other, so as long as the venue has lots of built-in risk-reward it will do just fine. Of course I’d love to see a Ryder Cup on a classic, strategic links (St. Andrews!) or a non-stop stress-fest that pushes them to the breaking point (Kiawah redux!). But, blessedly, the Cup is the one big-time event at which we don’t have to invest too much emotion in the course, because it’s a secondary concern. Why do you NOT send out Tiger and Phil as the first pair out on Friday morning? [email protected] Hell yeah, let's do it. Let's blow the doors off this Cup! That probably mean sacrificing Tiger and Bryon in alternate shot that afternoon but so what? They can reprise that pairing on Saturday. Sending out Tiger and Phil first would put a huge charge into this event. It's what the world is clamoring for, and sometimes you gotta give the people what they want, strategy be damned. Over/under that Tiger wins 6 more majors? -Justin @imunderpar4win That must be some medicinal grade stuff you’re smoking, homey. It took a lifetime for Lee Trevino to win six majors. Nick Faldo, too. You think a broken-down 43-year-old is going to peel off six more, against deeper fields and amidst unparalleled scrutiny? I know we’re all a little euphoric after East Lake but c’mon. (Counter-point: Tiger is Tiger again so anything is possible.) Is it normal for a grown man to cry like a baby over another man’s accomplishments? [email protected] In a word, yes. It’s why sports remains such a galvanizing force in all of our lives. I’m merely an impartial observer but I felt this win in my bones. What a ride it’s been, for all of us.